The perfect box for the odd size gift or jewelry. Two-piece 7x5x7/8" Brown Kraft Jewelry Box with recycled non-tarnishing eco fiber. Made in the USA. Jewelry boxes contain 100% recycled boxboard which is the largest component of the box by weight, does not include paper outer wrap. Recycled Natural Brown Kraft Jewelry Boxes are two-piece rigid set-up boxes filled with non-tarnishing eco fiber. 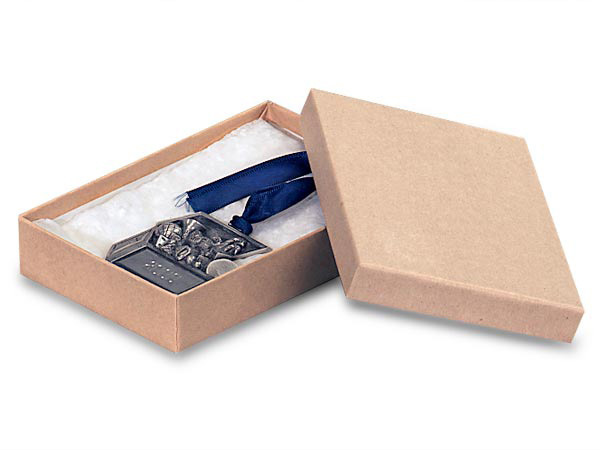 Jewelry boxes contain 100% recycled boxboard which is the largest component of the box by weight and the overall recycled content is approximately 80% including coverings. Great for items such as small earrings or large silverware. Available in many sizes and packed in 100's. A pre-packed 72 pc assortment is also available. Made in the USA.